During pressing with Yvon and Jules Métras this September we were often joined around apéro hour by Jules' good friend Yann Bertrand, an extremely talented young Fleurie winemaker who lives a stone's throw away in Grand Pré. He often wore a vaguely pained expression when he arrived. 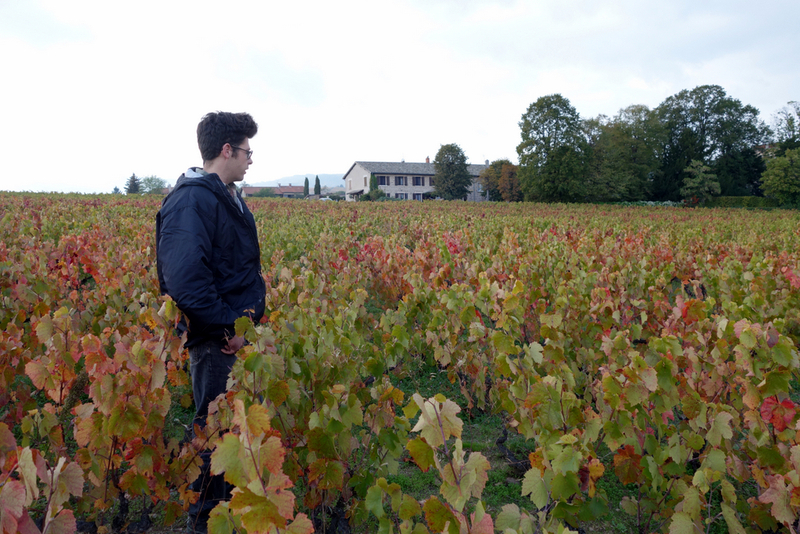 2015 in Beaujolais was a touch-and-go year for many winemakers, but Yann and his family suffered more than most. "My grandfather died, we buried him, then the next day I heard that all my tanks had bret. Then my car broke down," he says, wincing. "I said to myself, 'Sometimes it’s best not even to think about it.'" 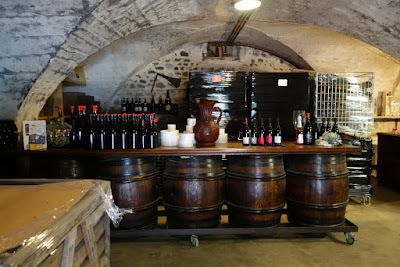 The Bertrand family shares cellar facilities with Yann's cousin and uncle, Romain Zordan and his father Claude, who make their own range of estimable natural Beaujolais under the name Château de Grand Pré. The story of the two winemaking families of the Château de Grand Pré is one I plan to explore in greater depth elsewhere. (Expect a post about the Zordans soon, too.) For now it seems worthwhile to discuss Yann Bertrand's work at at time when what many locals were calling his "beginner's luck" is being tested like never before. Bertrand is a statuesque, sleepy-eyed 24 year-old whose haircut gives him an extra 4cm in height. He resembles the archetypal high-school comedy geek in mid-transformation into a handsome jock. He hadn't planned to follow his father and grandfather into winemaking. He studied banking. It was only after finishing his studies and temping at a wine bar in the Alps that he came to appreciate his heritage. He soon enrolled in the viti-oeno degree in Beaune, where he met many natural winemakers from around France. He took a passionate interest in biodynamic agriculture. 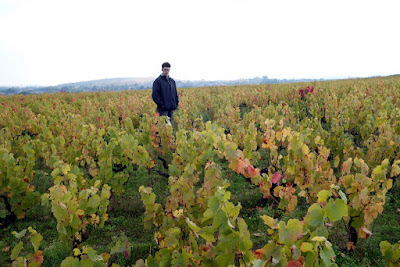 Yann Bertrand preparing a spraying of biodynamic preparation 500. Around the same time, his father's working relationship with his uncle was foundering amid the declining fortunes of Beaujolais wine-growing. By the wider standards of Beaujolais the domaine wasn't in bad shape: its 16 adjoining hectares of Fleurie and Morgon vines were all certified organic since 2000, and they managed to sell a fair portion of their wine in bottle to a network of private clients. But neither Guy Bertrand nor Claude Zordan ever attempted to cultivate the professional clients who would prove a bulwark against the ebbing prices of their negoçiant sales. The two had worked together since jointly taking over the domaine from Yann's grandfather Louis Bertrand in 1988. Louis had had the prescience to divide domaine ownership up, parcel by parcel, at the time of succession, even when the brothers-in-law were planning to continue working together. By all accounts things went smoothly when the brothers-in-law, aided by their returning sons, first harvested as separate domaines in 2012. 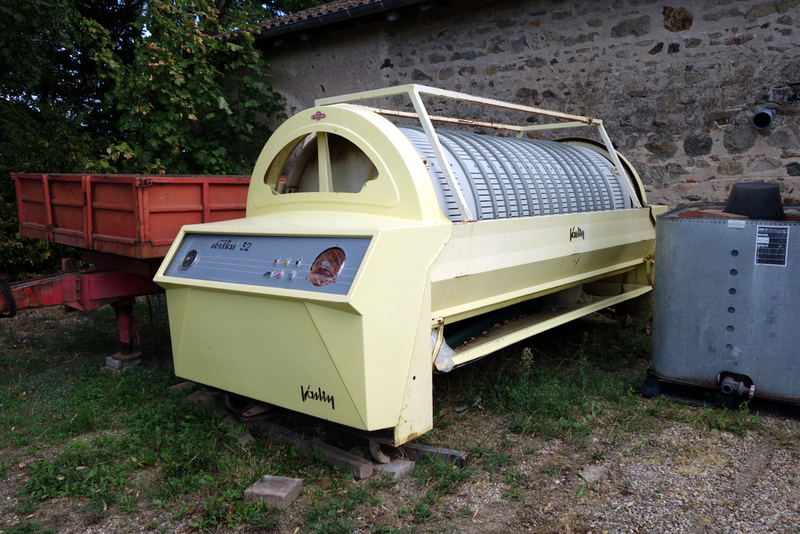 Yann currently shares an old Vaslin press with his cousin and uncle. He hopes to source an old wooden press at some point. 2012 marked Yann Bertrand's first foray into what he considers his work, as opposed to the wines he makes with Guy and his mother Annick. Yann makes two parcel cuvées of old-vine Fleurie (1,10 ha) and Morgon (0,9 ha) that he farms biodynamically and vinifies without sulfur, entitled, respectively, "Cuvée du Chaos" and "Biodynamite." Both were, it's fair to say, instant smashes, locally and abroad. 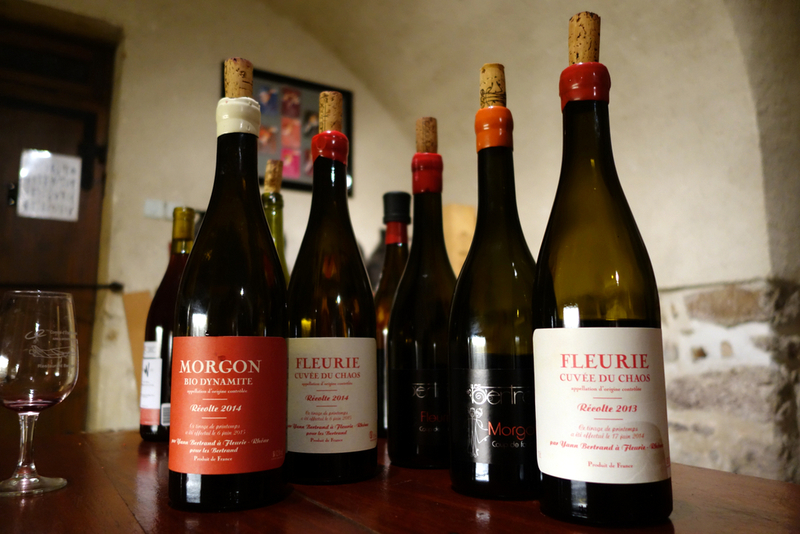 I can't count the number of bottles of each I consumed in Beaujolais this past fall. If I wasn't ordering them at the Café des Sports or L'Atelier du Cuisiner or Le Relais des Caveaux, someone else was. Both the "Cuvée de Chaos" and the "Biodynamite" are made in the long, cool semi-carbonic style made famous by the wines of Yann's neighbors and mentors: Yvon Métras, Jean Foillard, etc. This means harvest in small bennes, brief refrigeration of grapes before vatting at 10-12°, and a long fermentation of between 20-25 days. The families' shared refrigeration truck. Yann benefits from mentorship from one of the key innovators of many of these techniques, itinerant winemaker and renowned Jules Chauvet-acolyte Jacques Néauport, who began discreetly returning to Beaujolais in 2012 after having apparently been unofficially banished for something like a decade, following a dispute with Marcel Lapierre that was left unresolved at the time of the latter's death 2010. There remains a durable local ómerta regarding the details. I gather Néauport remains persona non grata in the eyes of many of the region's great winemakers, but these same winemakers, interestingly, remain very neutral on the subject of Néauport providing counsel to the region's younger vignerons. Néauport flits around rather widely, though by all accounts his relationships with other recently-installed winemakers don't approach the mind-meld he maintains with Yann Bertrand. Yann applying the biodynamic preparation 500 to the "Cuvée du Chaos" vines. Yann hopes eventually to convert all 7,5ha of his vines to biodynamic agriculture, while simultaneously applying the harvesting and vinification techniques of "Cuvée du Chaos" and "Biodynamite" more fully to the rest of his family's range, which includes Morgons and Fleuries in two other ranges, the old-vine "Coup de Foudre" wines, and young vine Morgon and Fleurie entitled "Coup de Canon" and "Coup de Folie," respectively. (And, I might add, confusingly. His entire range would be improved by ditching the "Coup de -" fantasy names, and finding less goofy ones for the biodynamic cuvées.) Already the second bottling of the Fleurie "Coup de Foudre," which saw no sulfur addition at bottling, shows an impressive flintiness beside its lucent fruit. 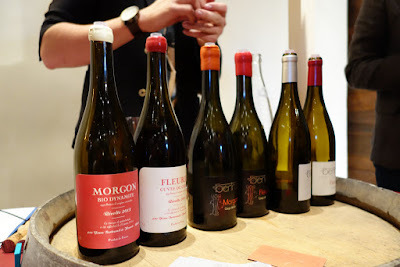 Bertrand has particularly high hopes for the "Coup de Foudre" Morgon, kissing his fingers when he speaks of the 60-year-old vines from which it derives. 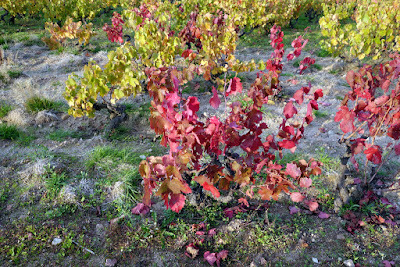 Old vine Morgon, with many vines missing. 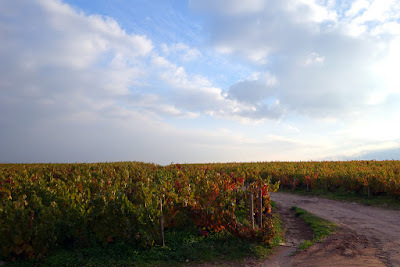 "The 'Cuvée de Chaos' and the 'Biodynamite' were the first parcels where I tried biodynamics. Before the vines were totally imbalanced. They didn’t really work," he explains. "But the 'Coup de Foudre' parcel is balanced from the beginning. If I manage to pull off [cool-carbonic vinification] on this, I’m persuaded we’ll make some really great bottles." "It’s what I tried to do this year," he says, adding, "Unfortunately it wasn’t the destiny in fermentation." Yann was obliged to pre-filter during fermentation this year due to the appearance of brettonamyces in his tanks, a result of a perfect storm of bad circumstances. A cyclical nitrogen deficit in the grapes, plus the elevated alcohol levels of the vintage, hindered the growth of positive yeasts, while the vintage's thick grape-skins and lack of juice impeded physical intervention in the tanks. The bret wasn't apparent on tasting, but he confirmed it under a microscope. "Even if it doesn’t smell in the wine, at a given moment it'll spoil. It can get through the winter, because it is cold and the bret rests. But you wait for the summer, and it grows, and if you bottle it then it’s uncontrollable. You find yourself with 10,000 bottles of bret." His solution wasn't easy. He rang up his fellow vignerons and asked for transfusions of their lees to re-start fermentation in his tanks after filtration. Presumably instances like this are why it pays to be neighborly in the countryside. His friends pulled though for him. "The filtration stopped the bret cleanly," he said in early November. "Then, since you start from a blank page, the lees gave it back the aromatics. Today it tastes good, I’m pretty happy." Hell-raiser vintages like 2015 are the crucible through which guys like Yann suffer to become great winemakers. His wines will probably taste unusual in 2015. Then again, so will everyone else's, bret or no bret. What everyone is aiming for - what Yann, Guy, and Annick went to fanatical lengths to achieve - is an unusual kind of excellence. Some nice photos of Yann and his family at the site of his US importer, Paris Wine Company. 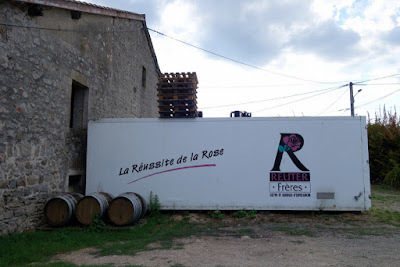 Some focus on of Yann Bertrand in this 2015 Rue89 article about newly-installed winemakers in Beaujolais. 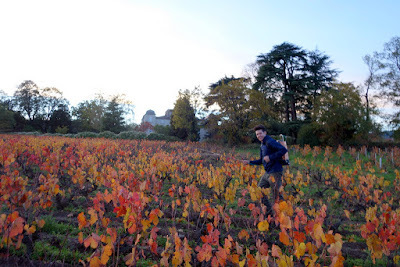 A brief 2014 post on the Yann and his "Cuvée du Chaos" at Le Du's Wine Blog.